The norma frontalis is roughly oval in outline, being wider above than below.The norma frontalis is roughly oval in outline, being wider above than below. The frontal bone forms the forehead. Its upper part is smooth and convex, but the lower part is irregular and is interrupted by the orbits and by the anterior bony aperture of the nose. The right and left maxillae form the upper jaw. The right and left nasal bones form the bridge of the nose. The zygomatic bones form the bony prominence of the superolateral part of the cheeks.4. The zygomatic bones form the bony prominence of the superolateral part of the cheeks. The mandible forms the lower jaw. (c) anterior piriform-shaped bony aperture of the nose; and (d) lower part of the face. The superciliary is a rounded, curved elevation situated just above the medial part of each orbit. It overlies the frontal sinus and is better marked in males than in females. The glabella is a median elevation connecting the two superciliary arches. Below the glabella the skull recedes to the frontonasal suture at the root of the nose. The nasion is a median point at the root of the nose where the intemasal suture meets with the frontonasal suture. The frontal tuber or eminence is a low rounded elevation above the superciliary arch, one on each side. 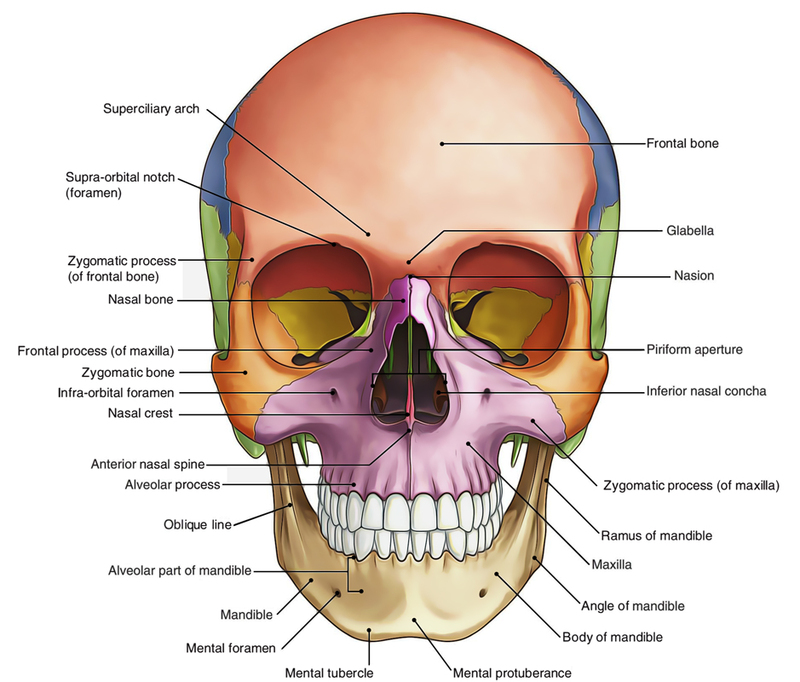 The supraorbital margin is formed by the frontal bone. At the junction of its lateral two-thirds and its medial one-third, it presents the supraorbital notch or foramen. The infraorbital margin is formed by the zygomatic bone laterally, and the maxilla medially.2. The infraorbital margin is formed by the zygomatic bone laterally, and the maxilla medially. The medial orbital margin is ill-defined. It is formed by the frontal bone above, and by the lacrimal crest of the frontal process of the maxilla below. The lateral orbital margin is formed mostly by the frontal process of zygomatic bone but is completed above by the zygomatic process of frontal bone. Frontozygomatic suture lies at their union.